IMPORTANT TO READ BEFORE USING THIS TAB GENERATOR : This tab generator, created by Wifeo, is a free resource for personnal or professional use. To use this tab generator Facebook, Google+, Twitter, etc.., first set the style of your tabs, then in the bottom of the page insert the URL of your various social networks' pages (Facebook, Google+, Twitter, etc.). Just imagine orange boxes represent screens (for these demos, only Facebook and Google+ are displayed). Move mouse to play the effect ! 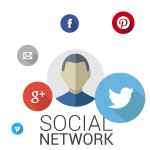 CSS Generator tab for Facebook, Google+, Twitter, and other social networks by Wifeo is licensed under a Creative Commons Attribution-ShareAlike 4.0 International License. Based on a work at http://www.wifeo.com/social-networks-tab-generator.php.